Coll. No. 1481, 29 June 2016, characters observed: Perennial herb, to 25 cm., from tap root, ±spreading hairy and lightly glandular throughout; Leaves, basal and cauline, basal, petiole 25 mm. + blade 30 mm. × 10 mm. wide, lanceolate, deeply pinnafitid, margins toothed, cauline, alternate, similar but reduced above; Inflorescence, panicle or thryse, not coiled; Calyx, 4 mm., lobes #5, 3.5 mm. × 0.5 mm. wide, Flowers, actinomorphic; Corolla, tube 3 mm. + lobes 1.5 mm. × 2 mm. wide, spreading, tip round, purple; Stamens, #5, alternate, exserted 5 mm. ; Ovary, superior, 1.8 mm. × 1.3 mm. wide, hairy distally; Styles, #1, 8.5 mm., forked, hairy proximally; Stigma, thread-like; Seed, unknown. County Route 3, Lake County, Colorado. : at CR 3B W.
Field Notes: Coll. No. 1481, 29 Jun 2016. 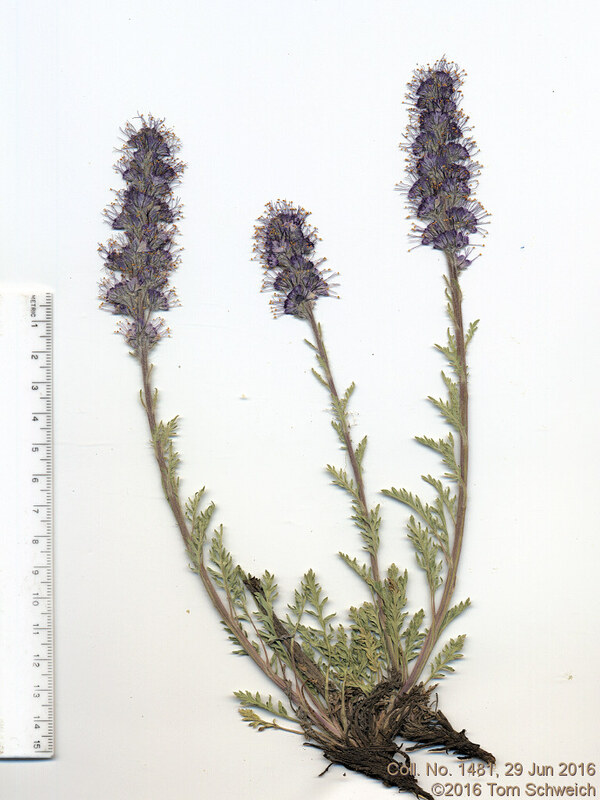 Other photos about Species - Boraginaceae or Boraginaceae Phacelia sericea.